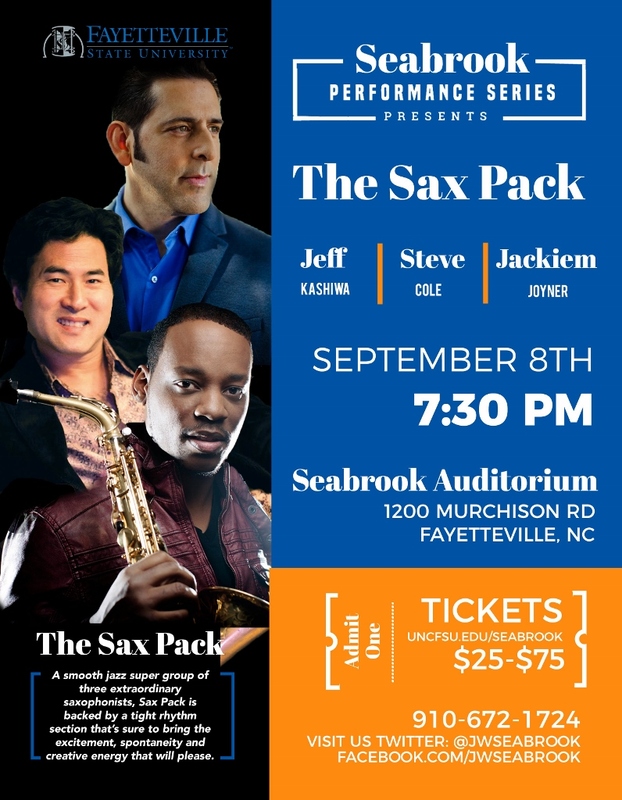 Smooth jazz super group The Sax Pack, will kick off the 2018-19 season for Fayetteville State University’s (FSU) Seabrook Performance Series (SPS) with a concert, 7:30 p.m. on Sept. 8th, in FSU’s J.W. Seabrook Auditorium. Consisting of nine shows, FSU's SPS will host jazz, blues, gospel, acrobatics and comedian/magician events through spring 2019 at J.W. Seabrook Auditorium. The full season line-up will be announced at the kickoff. A group of three extraordinary saxophonists, The Sax Pack features Jeff Kashiwa, Jackiem Joyner and Steve Cole. Each band member individually has more than a dozen smooth jazz radio hits and have sold tens of thousands of albums. Collectively, The Sax Pack has released three CD's, The Sax Pack(2008), The Sax Pack is Back (2009) and Power of 3 (2015). Their albums have reached numbers 13 and 16 on the Billboard chart. Backed by a tight rhythm section, the talented trio combine their life-long love of music and their passion for performance, to make an impact on audiences that love music as much as they do. Committed to sharing the excitement, spontaneity and creative energy that flows between them on stage, The Sax Packinspires an audience far beyond the duration of a show. The idea of The Sax Pack originated in 2004 with Jeff Kashiwa after he saw a movie about the Rat Pack, a group of legendary entertainers led by Frank Sinatra, Dean Martin and Sammy Davis, Jr. Inspired by their showmanship and camaraderie, Kashiwa came up with the name The Sax Pack and called on some of his saxophone peers to start the group that would feature the instrument, as well as their collective musical passion for jazz, funk and R&B. Tickets costs $25 to $75. To purchase tickets, visit: uncfsu.edu/seabrook.